GE announced today a deal to buy privately-held Vancouver-based cybersecurity firm Wurldtech, underscoring the increasingly hot market for cybersecurity tech firm acquisitions. Wurldtech specializes in cybersecurity technologies for critical infrastructure industries and big industrial concerns including power plants, oil refineries and other key providers. 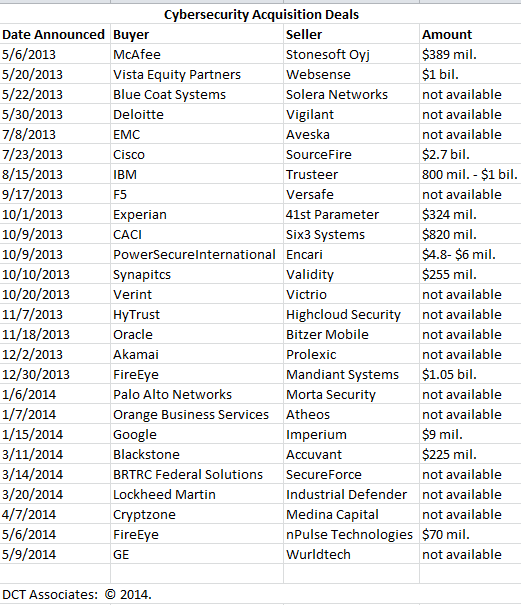 This deal follows FireEye's $70 mil. announced acuqisition of nPulse technologies earlier this week and caps a string of at least 26 cybersecurity acquisition deals over the past year. (See table below.) Clearly it's a good time to be a cybersecurity tech start-up or well-respected small solutions supplier.